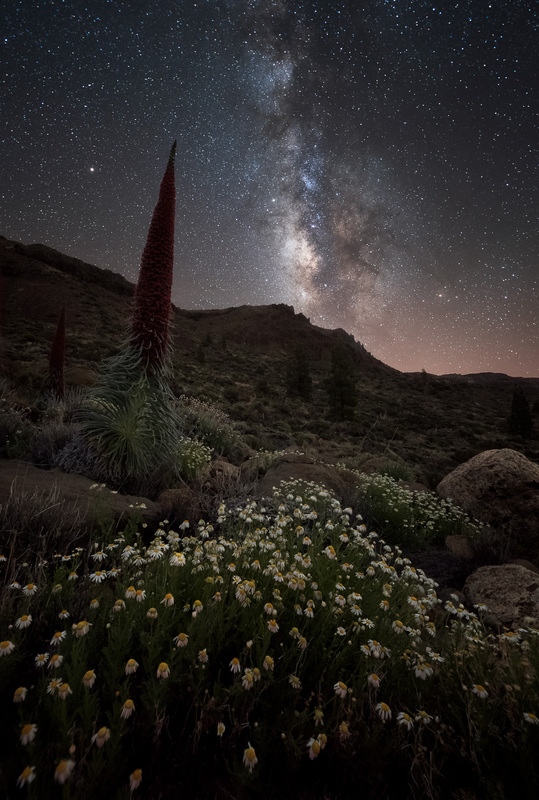 Tenerife offers some of the darkest skies in Europe and an other worldly landscape of volcanic terrain. Teide National Park sits above a sea of cloud and is overlooked by the dominating peak of Teide itself which stands at an impressive 3718m, making it the highest mountain across all of Spain. In 2014 it was awarded “Starlight Destination” status and it is also home to the Teide observatory. Whilst in the UK the summer nights can be extremely short and not completely dark, Tenerife will offer us 8 hours of darkness to enjoy some fantastic views of the Milky Way during what is the height of Milky Way season. Our trip will also be timed with the spectacular bloom of the Tajinaste flower, some of which can tower up to 3m tall! They are endemic to the island of Tenerife and speckle the otherwise lunar landscape with a gorgeous hint of colour and life. Another highlight of the trip will be taking the cable car up Mt. Teide with a local guide to enjoy the sunset as well as some telescope observing from a height where you feel like you can already touch the stars. Once a year Tajinaste plants (Echium Wildpretii) bloom across the island with some towering to an impressive 2-3 metres tall! They are endemic to the Canary Islands but the red variety (Rojo) are only found on Tenerife. Once they have bloomed once they die and dry out over the remainder of the summer, leaving behind ‘skeletons’ which look incredible with a bit of back-lighting from the Moon. Not so long ago they were considered an endangered species, however, some careful conservation efforts have seen them begin to bounce back. The locations of the best blooms are normally kept hush for obvious reasons but Alyn has scoured the island to hunt them down and find the best spots. Alyn also kindly asks that care is taken to not cause any harm or damage to any wildlife on this trip. If you have no respect for nature, please do not book. Delegates will have mornings and daytime free to relax and enjoy the beaches and swimming pool and Alyn will be on hand should anyone require transport to a nearby location. Some afternoons will involve post-processing sessions and some theory tuition in twilight and night photography. In the evening we will jump in the minibus and drive above the clouds to explore the volcanic lands of Teide National Park. Access to locations are easy with little hiking involved and there’s plenty to play with. 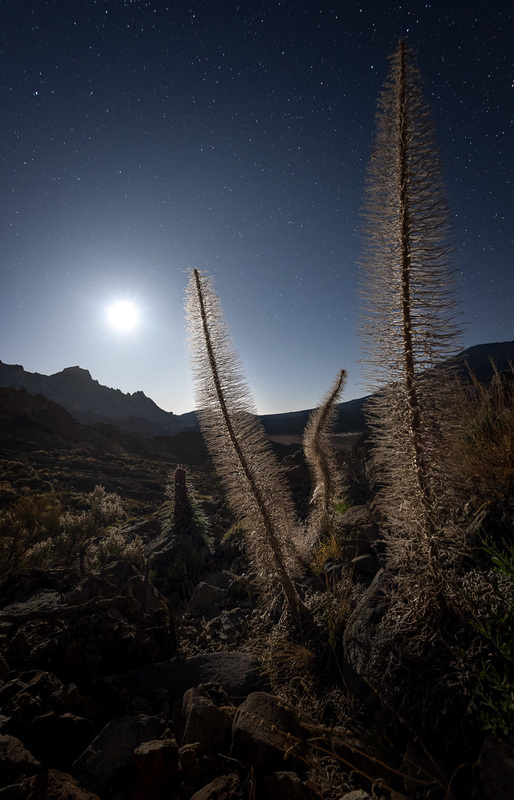 The Tajinaste bloom is a special once in a year event but we will also be photographing telescopes, rock formations, volcanic calderas and of course, Teide itself. We will also look to fit in some daytime landscape photography, including sunsets at the coast, villages in the mountains and forests in the mist. Another highlight of the trip will be ascending Mt. Teide via cable car with a local guide so that we can enjoy the sunset from the highest mountain in Spain. From there we can capture the incredible triangular shadow of Teide extending across the sea. We will also be able to see all of the other Canary Islands from our vantage point (weather permitting). We will then enjoy some telescope observing from a stunning viewpoint of the volcano, Pico Viejo. We will be staying in the Puerto de Santiago area. With a black sand volcanic beach it hasn’t seen the heavy hit of tourism like the golden sand areas and so is a little quieter than the normal party zones. Just to the north is the stunning area of Los Gigantes and to the south is the popular beach Playa de la Arena. Each guest will have their own single-bedroom apartment with a sea-view balcony. There is a large selection of flights to Tenerife given its popular status as a tourist island. There are even flights from budget airlines like Ryan Air and Easyjet. Delegates are advised to fly into Tenerife South Airport as opposed to Tenerife North Airport and Alyn will provide further assistance upon reserving a place.